A New Hampshire state representative's gun-toting wedding photo popped up for people who used Google to search for Londonderry, despite both town officials and the state lawmaker's reportedly asking the search engine behemoth to take it down. A Google photo representing the town of Londonderry, New Hampshire, is causing some controversy for the second time this year. 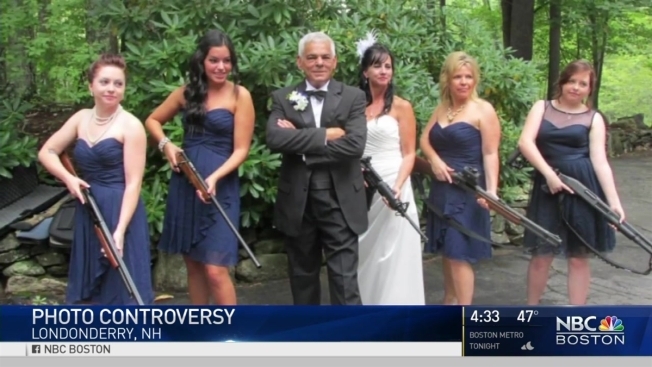 The 2013 photo shows State Rep. Al Baldasaro's wife Judy with her wedding party posing with long guns with the groom. As happened earlier this year, Google's algorithm has caused the photo to surface as the town's image in a search of "Londonderry." When nearby residents saw how the image that represents their town online, we found some strong opinions. "It looks redneck-ish to me," said Eric Nadolink. "It's almost offensive," said Joanne Mele. "It definitely doesn't represent the town," Brian Nadeau said. Some don't like the fact that a long-gun toting wedding party was synonymous with Londonderry. "I wouldn't be proud to say, 'That's my town and that's what we stand for,'" explained Mele. "I think that's awful." Others say it was quite fitting. "A lot of people in Londonderry support the Second Amendment," said Bob Coco. "I see no problem with it." Baldasaro, the man at the center of the photo, was busy at the New Hampshire State House Tuesday, but NBC Boston reached him by phone. "I'm kind of surprised, I guess," he said. "I must be popular around the country." The last time this happened, Baldasaro contacted Google and had the picture removed, because he says he agrees with folks who feel the photo is misplaced. "I understand it has no business being where it is," he said. Baldasaro said his wife contacted Google Tuesday morning. By 4 p.m., the photo was gone. Still, he has a message for those Granite Staters offended by his wedding photo. "You live in New Hampshire. We are a Second Amendment state," Baldasaro said. "So, if someone is worried about guns — I'm sorry, you're in the wrong state."